Sweatpants & TV | The Vampire Diaries, 7x05 – "Live Through This"
In the present, we find Damon barging in on Stefan and Caroline’s snuggly time, but – hey! – at least, he brought coffee. He’s had an epiphany! – oh boy. He is going to do right by Elena by turning over a new leaf and, of course, Stefan has to help. First step? Questioning a ‘tall heretic with a bad attitude’. Damon doesn’t know that his first love is the same deadly heretic, though Caroline is quick to explain. Damon puts the pieces together, exclaiming, “V-Card Valerie! 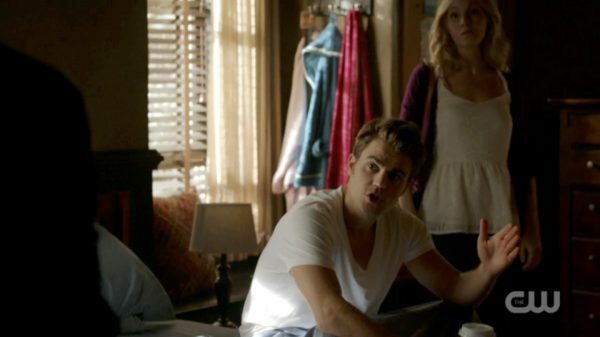 ?” as Stefan gives him a desperate look to stop before …uh-oh, Caroline is looking a little unhappy. Valerie has taken off in Donovan’s SUV to find Julian before Lily can. Damon promptly roadblocks her and refuses to move until she answers his questions about why she would kill Oscar and frame him for it? She tires of his threats quickly and uses magic to debilitate him until Stefan appears behind her, asking her to tell him exactly what is going on. So, they set off to find Julian together. ROADTRIP!!!!! The most awkward one ever. During a gas station pit stop, Stefan calls Caroline and asks her to dinner. Not a guilt dinner, mind you, but a first date dinner. She agrees and awkwardly admits she likes daisies… if, you know, he was going to bring flowers or something (he will now, unless he’s stupid). While they discuss their plans for Julian, Valerie tells him that he’s already dead. Say what? Oscar has hidden his body away from Lily so she can’t use the Phoenix Stone to bring him back. 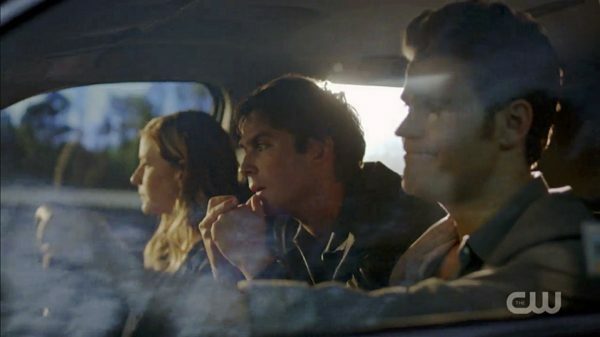 As Damon breaks into Oscar’s hiding place without help, Valerie and Stefan bicker about their former relationship and Valerie’s violent tendencies. They finally bust in, only to discover that Oscar is quite the prank master. 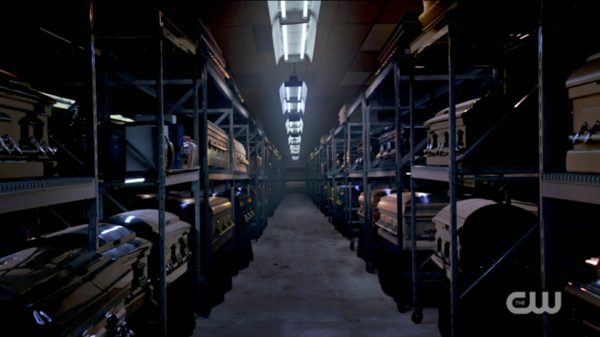 They start for the coffin that contains the corpse of Lily’s love. Back in Mystic Falls, Bonnie has made a trip over to the Salvatore house to have a quick chat with Oscar about the Phoenix Stone. He doesn’t remember Bonnie from Myrtle Beach, but he remembers that she got him out …out of the Phoenix Stone. With some very good timing, Damon calls Bonnie to warn her about the real nature of the Stone. Valerie confirms Oscar’s story, telling Damon and Stefan how it works and how Lily plans to use it. 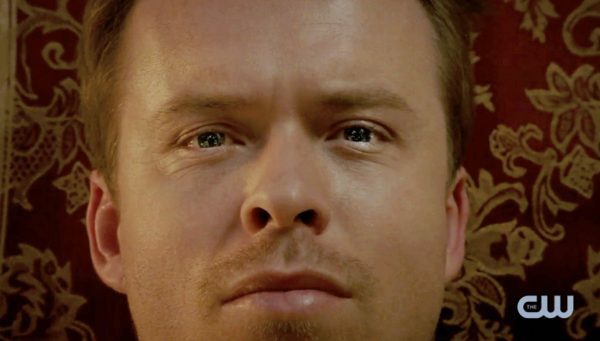 She is determined to reunite Julian’s soul with his body using the Stone. The Stone doesn’t just bring back the dead, it deposits one of the many ancient vampire souls trapped in the Stone into empty body. Julian is in that Stone and Jo isn’t Jo. Speaking of Jo, over at Rick’s place she is contemplating what a TV is, and delivery food, and her name, for that matter. It seems she too, has a memory problem after waking from the dead. She seems sane, though: no insatiable, bloodlusty hunger, except maybe for Thai food. As Rick explains to her how she died, the memory comes back, except – in her memory – she wasn’t stabbed in the back by Kai, she was stabbed in the heart! Something is wrong and she knows it. She takes off, leaving Rick in the dust. He goes after her and, together, they agree that she isn’t Jo. As heartbroken as he is, Rick tells her she’s not alone and he will help her figure out who she really is. About the time Valerie finally finds Julian’s coffin, Lily appears furious that Val has been conspiring behind her back with her own sons. Lily spews her soft, sad love story, trying to discredit Valerie’s claims that Julian is a bad man, but – before she can take him away – Valerie has a story of her own: it was Lily that gave Kai the idea to put Elena in the sleeping curse as revenge for not helping her escape the prison world. Damon is understandably angry, but – before he has a chance to take out his anger with violence – the heretics make all the coffins explode and Lily escapes with Julian. 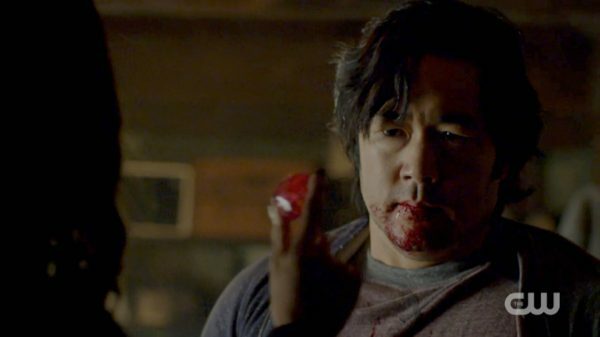 Stefan looks for and finds Valerie and, as he helps her pick out the shards of wood in her chest, she finally tells him her reasoning behind killing Julian. She tells him their story. Understandably, Stefan is devastated, just as we knew he would be. Would Stefan have wanted a child? He admits that he would. Not able to go back to Lily’s, Stefan offers Valerie a place to stay and cancels his date with Caroline, not telling her anything about what he has learned about Valerie. Is this the beginning of the end of Steroline? I’m very interested to find out how things progress with NOT Jo. How do the twins come about? If the Phoenix Stone only stuffs dead vampire souls instead the dead body, how could Jo and Alaric’s twins have survived? – they obviously aren’t old vampires in tiny toddler bodies… or at least they don’t seem to be (that would be weird. Even for TVD). Julian is alive and Damon is going to make sure he doesn’t stay that way. The Vampire Diaries "Live Through This"